Angela Hewitt’s Bach Book is a successor to A Bach Book for Harriet Cohen dating from 1932, collecting arrangements from leading composers of her day. Hewitt’s book includes two of the original arrangements – by Walton and Howells – together with her own transcriptions of three organ chorale preludes from Bach’s Orgelbüchlein (which you can hear on her Bach Arrangements CD) and six new works commissioned by the Wigmore Hall from composers Brett Dean, Robin Holloway, Elena Kats-Chernin, Dominic Muldowney, Kurt Schwertsik, and Yehudi Wyner. A Bach Book for Angela Hewitt is dedicated to the memory of Michael Steinberg who first suggested to the pianist the idea of commissioning new works inspired by Bach. 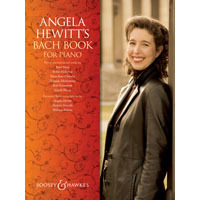 Angela Hewitt’s Bach Book is published by Boosey & Hawkes on November 20, 2010.